WHAT IS IT about your favourite records that makes you love them? WHY DO certain combinations of sounds surcharge your soul with emotion? HOW CAN a chord progression invoke an elevation to an untouchable location? Passionate artists like Camo (Reini) and Krooked (Markus): Two young Austrians who met on the skateboard but made a lifelong pact in the studio almost 10 years ago. Quickly identifying a shared vision and thirst for sonic communication, the pair have been asking themselves the questions above (and many more) since their earliest releases in the late 2000s. At first they found answers within the high energy, chaotic parameters of drum & bass. But, as they've persisted on their quest, found more answers and asked more questions, they're now exploring a much wider world of musical possibilities. For artists so young, they've already achieved a huge deal: Few electronic acts are staring down the barrel of their fourth album at this stage of their career. Even fewer artists have created a made-to-measure live experience with as much attention to detail as their Zeitgeist show. But everything you know about Camo & Krooked so far barely scratches the surface compared to their next ambitious project. Here's what they're up to… And how they got there. These paths have been teased throughout their career – particularly with the brushed metal electro sheen of 2011's 'Make The Call' and 2010's paranoid minimal tech alias Chrome – but were properly swathed down in September 2013 with the release of their third album 'Zeitgeist'. After two successful thoroughbred drum & bass albums – 'Above & Beyond' (Mainframe, 2010) and 'Cross The Line' (Hospital, 2011) – 'Zeitgeist' was a game-changing document that showed Reini and Markus's true passions, musical scope and future vision. Disco, techno, soul and funk were brazenly smelted down as the young duo carved delicate synthetic textures with soft plucks, spacious minimalist design and detailed arrangements. Abandoning scene expectation and fears of technical limitation, 'Zeitgeist' was a calling card for a genre-free future where artists transcend boundaries created by the fans, the labels and, ultimately, themselves. Joining them on this journey is essential. Many producers already have; the electric emotion and cosmic textures of 'Zeitgeist' are already being referenced, deftly nodded to and blatantly copied across drum & bass. The referees have become the reference: Now, in the true spirit of exceeding past accomplishments, they're about to take this sound, spirit and creative ideology to a new level. In the aftermath of 'Zeitgeist' and its ambitious bespoke hi-tech live show, Markus and Reini have continued to study and analyse musical dynamics; how sounds ignite emotions and feelings from deep within, how space and silence are just as important as the musical elements. Above all: how music tells its own unique story. Studying the new masters from Jon Hopkins to Tame Impala to David August, Markus and Reini have toiled hard to understand their shared vision of their musicality and, most importantly, how they want to translate it to us. Rather than use the same old in-the-box language, they've amassed a collection of analogue hardware to help them chisel and hone these messages furthermore: A Moog Sub37, Prophet8, Roland Chorus Echo, JoMoX MBaseII, Studer 961 mixing desk, mics to record their own percussion and drum libraries… The list is building, slowly but surely. Each machine helping them articulate their unique sound and define their own creative boundaries. The first taste of these analogue experiments since 'Zeitgeist' emerged in June 2015 with 'Gravitas'. A dreamy, arpeggiated composition, it was the bespoke result of a creative partnership with Red Bull's skydiving team, created to soundtrack one of the most beautiful aerial stunts the team have ever displayed. Sitting at a pensive 115BPM, 'Gravitas' instantly smacked of Camo & Krooked's sound while rolling at a tempo they'd never explored before. Another example of Markus and Reini's musicianship, it acts as the quintessential tease for their highly anticipated fourth album. 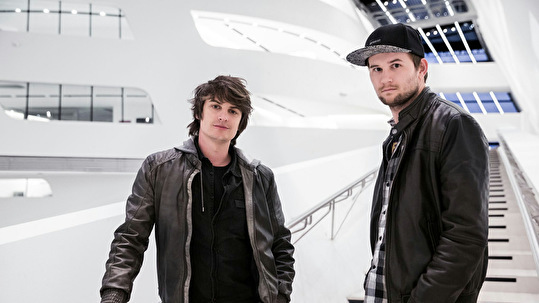 Camo & Krooked's new album is their most ambitious project to date. Joining Markus, Reini and their stash of outboard kit are a score of local upcoming vocalists (because they love working with new artist and supporting Austrian talent), wild-skill session musicians (because they know their own technical limitations and when to call in a pro to replicate their own strums and sketches) and industry professionals such as award-winning pop architect Simon Britton whose discography is peppered with legends from Kool & The Gang to Eminem, Usher to Jimmy Cliff. Even by the duo's widescreen standards, it's a brave new musical world. Building new sonic skylines on the impressive structures of their past, tracks such as the sun-freckled reflectivity of 'Like I Do', the delicate keys of 'Black & White', the slo-mo techno drones and dark bass tones of 'If Else' galvanise Markus and Reini's capabilities well into the future in a way that's not been done by their peers before. Many hugely respected artists who first came to fame in drum & bass have gone on to succeed on bigger stages… But not in the way Camo & Krooked intend to do it. 'We put so much effort and blood, sweat and tears into writing something that's unique and fresh and not already done," states Markus. 'We don't want to be the next big radio act"
'I wonder how long it will take till the bubble bursts? When radio moves on, everyone moves on… We want to make a deeper connection. We want people who stay with us and join the journey and not people who just respond to the hype and move-on as quickly after. But we can only do this if we are true to ourselves." With honesty and clarity as strong as their sonic signatures and musical passions, this is the sound of two men on a lifelong quest to understand and unravel the complex and subjective human relationship with music. This is the sound of two men at a newfound creative peak. This is next level Camo & Krooked. Camo & Krooked - History of the future. Genieten!